Our #1 trusted diaper*, HUGGIES LITTLE MOVERS are designed for active babies. Featuring the latest addition to the HUGGIES MOVING BABY SYSTEM, the SIZEUP indicator, LITTLE MOVERS diapers let you know when it’s time for baby to move up to the next diaper size. HUGGIES LITTLE MOVERS provide our best fit ever, with a contoured shape for comfort and DOUBLE GRIP STRIPS that hold the diaper in place during active play. Inside, the DRY TOUCH liner absorbs wetness on contact, while the absorbent LEAK LOCK SYSTEM provides up to 12 hours of protection. LITTLE MOVERS diapers feature a WETNESS INDICATOR that changes from yellow to blue when wet, so you know when your baby is ready for a change. HUGGIES LITTLE MOVERS come in size 3 (16-28 lb. ), size 4 (22-37 lb. ), size 5 (>27 lb.) and size 6 (>35 lb.) and feature fun Disney Mickey Mouse designs. Stock up and keep HUGGIES LITTLE MOVERS diapers on hand as your baby explores the world. Dry Touch absorbs on contact. Leak Lock with double grip strips for up to 12 hour protection. I always order my two baby girls diapers online. One uses Huggies Pure&Natural because she has very sensitive skin and my other baby girl uses these diapers, Huggies Little Movers. 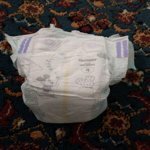 On another site where I order her diapers other people's reviews were negative towards this diaper. They said that not only has the outside changed to Mickey and Minnie, but the whole diaper itself isn't the same anymore. I beg to differ. Even though these diapers don't have the cute Winnie the Pooh and his pals on the diapers doesn't mean it isn't the same diaper. They are exactly the same. My daughter wore the new Mickey design diaper for a couple of hours and nothing happened. No blow outs or leaks. The reviews on this other site where I order diapers, people said they have been experiencing blow outs and leaks. Please do not be afraid to purchase your favorite diaper! I am sad to see Winnie the Pooh to go, but these diapers are still soft, curvy, absorbent and durable. My baby is large for his age and it's been hard to find a diaper that stays put. The side taps always pull out and my baby garbs them and off comes the diaper. This product has solved this problem. Why did they change them?!?! I just want to cry right now! We've used Little Movers for over a year now. We ran out and our Wal-Mart was completely out of our size in the big box. I LOVE these diapers enough that I bought a small package to get us through until I could order some online. We get home and I open them and they are totally different! I could care less if the outside of the diaper was plain white, but they feel so thin and cheap! Where did the cozy soft diapers that I love go?! We used the snug and dry ones a couple of times and abandoned them because they just weren't even attempting to be soft—seems like these feel that exact same way now. And they're not nearly as absorbent and just don't fit the same. Now I'm stuck in a state of panic trying to find a new brand of diaper. Why Huggies?! Why?! Hi, WendiP! We're sad to hear you're unhappy with our Huggies Little Movers diapers. We'd like you to know that we have recently updated our Huggies Little Movers diapers with brand new graphics and we've also updated our Size Up indicator to a new "button" graphic to make it easy to identify. Otherwise, we haven't made any changes to the ingredients or materials used, so these should be the same Huggies Little Movers diapers you've come to know and love. We wouldn't expect for there to be a change in quality so we'd love a chance to speak with you personally to learn more and help! Please hang onto the packaging and reach out to us online at https://www.huggies.com/en-us/contact-us or call 1-877-648-2484 (available weekdays, 7:30 a.m. to 7 p.m. CST). Thank you! I have been using huggies since I had my first child who is 20 years old now, and now I have another baby who at this moment is 17 months old. I'm really asombrate because huggies hasn't the same quality that used to have, the last packet that I bought has poor quality and my baby is getting wet every moment. We're glad you were a long time part of our Huggies family and we're sad to hear about your most recent experience since we always want to provide your family with high quality products. We'd like to find out more about what's happening so please contact us online at http://bit.ly/8ZuAUH or by phone at 1-877-648-2484 (weekdays, 7:30 a.m. to 7 p.m. CST) so we can help. Thank you. Terrible. Not soft at all. This 104 box were not the normal kind that come in the smaller boxes. The entire diaper was different. Not soft at all. The band around the waste was different. The abosrb beads on the inside keep coming off into my son. They don't hold much pee. The pad was thinner. I do not recommend buying the 104 box. I feel so disappointed with the quality this time. these daipers was so good bit now they are just like other daipers very light not so durable... very very disappointed with these. now I want to change my brand. I have used huggies little movers for both of my kids and this new “design” change is horrible. I have compared the old to the new side by side and there has been more than a design change. The quality has been changed, the elastic on the back has been changed and absorbency has been changed. Don't tell me it's just design change. I can feel the difference in quality the new ones feel rough like sandpaper! The elastic in the back is not snug either. I am very disappointed and I will no longer be using little movers . We appreciate your review and feedback. Our team did make some updates to our Huggies Little Movers diapers, including new designs, button graphic for the SizeUp indicator, and the double strip iFit for a more secure hold, but there were not any changes made to the ingredients and materials used, so we wouldn't expect what you're describing. We want to learn more so please contact us online at http://bit.ly/8ZuAUH or by phone at 1-877-648-2484 (weekdays, 7:30 a.m. to 7 p.m. CST). We look forward to hearing from you. I have always used huggies. Little snugglers first then snug and dry. I switched to little movers in August when my son started having leaks with the snug and dry. Well now that the design has changed he's leaking through these more than the snug and dry which are cheaper! I've seen the multiple review replys saying they have changed nothing but the image but that has to be incorrect. I don't know if maybe the material that the image is printed on has changed but thats what it seems like to me. It's like the wetness seeps right through. The entire diaper will be wet on the outside. I've used Huggies every step of the way and change which type of Huggies as my kids grow. I buy Huggies for any baby I shop for. I'm super disappointed in the change and the new quality that "hasn't changed" but obviously has. We appreciate your loyalty, and we're sad to hear about your most recent experience. Regardless of the graphic updates we've recently done, we still expect to provide your family with the quality products they've come to depend on, and we want to help. Please contact us online at http://bit.ly/8ZuAUH or by phone at 1-877-648-2484 (weekdays, 7:30 a.m. to 7 p.m. CST) so we can learn more. Thank you. 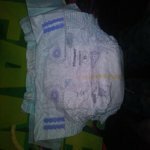 I have been a loyal huggies customer for 2 years now and the new diapers that you recently switched to are horrible they give my daughter a horrible rash now and aren't nearly as absorbent as the were before. I don't care about the design but the diaper itself isn't the same quality. I'm very disappointed and don't know what to do about it. We never want your little one to be uncomfortable and we’re sad to hear this happened. As caregivers ourselves, we know that irritation can be difficult to pinpoint since it can be caused by so many things and because each baby’s skin is different. While we did change the design graphics and the size-up indicator graphics (now buttons), along with upgrading the double-grip strip fasteners, the ingredients and overall design didn't change. That's why we'd also expect the same great performance you've grown accustomed to and we want to get to the bottom of this and help. Please know we rigorously test our products to ensure they’re gentle on even the most delicate of skin, so we'd like to learn more about your daughter's experience to see how we can help. When you have a moment, please connect with one of our specialists online at http://bit.ly/2M4U0Ci or by phone at 1-877-648-2484 (M-F, 7:30AM-7PM CT). We hope to hear back from you soon!